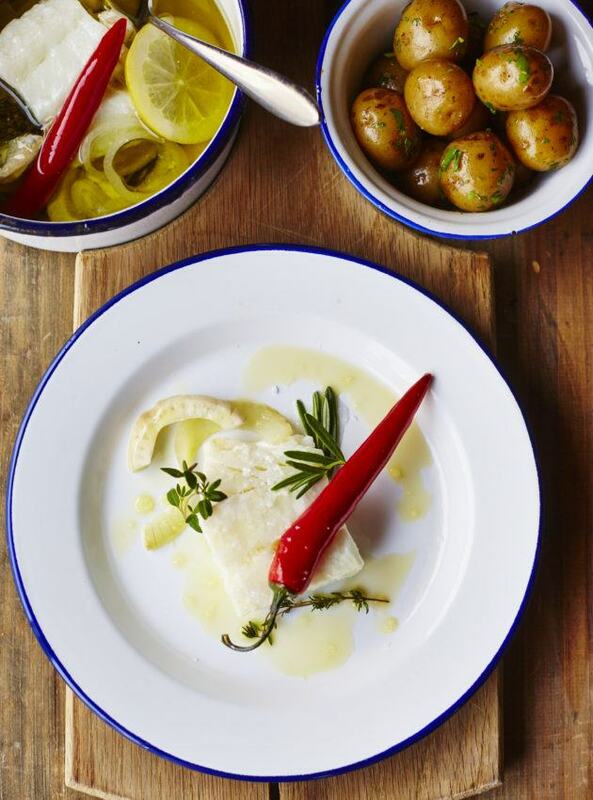 Making cod in a confit of light olive oil is a delicious way to preserve the tenderness and flakiness of the fish. For a special occasion, or just a weekend meal, this dish is great to awe your family and friends. So simple and so delicious! Enjoy. Heat one tablespoon of olive oil in a big saucepan on low heat. Simmer the onion, garlic and red chili for 2 minutes in the oil without them browning. Add the bayleaves, thyme, rosemary, lemon and the remaining olive oil. Stick a thermometer in the pan. Heat the oil until 60 °C. Gently place the fish in the oil. If the fish is not completely submerged, add more oil until it is. Cook the fish for 15 minutes and make sure the temperature remains 60 °C. Place the potatoes in a pan with cold water and salt. Bring to a boil and cook for 10-15 minutes. Drain the water and add the butter and parsley. Mix well and keep warm with a lid. Serve the confit cod with some of the aromatic oil, onion rings and herbs. Serve the potatoes on the side. Enjoy!